The remains of victims and children's clothing were strewn across a market in northern Yemen on Friday, as the US and UN called for an investigation into an air strike the previous day by a Saudi-led coalition that killed 29 children on a bus. 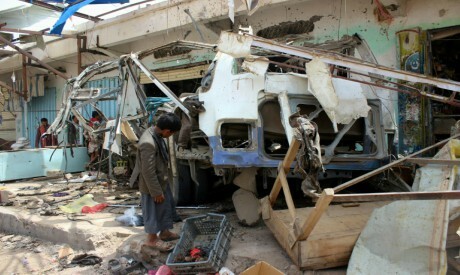 Thursday's strike on a bus filled with children at the Dahyan market in the Houthi rebel stronghold of Saada injured at least 48 others, including 30 children, according to the International Committee for the Red Cross. An AFP photographer at the scene said the bus carrying the children had been turned into a mass of twisted metal, and that the remains of victims and their personal items were scattered across the ground. The coalition that has been fighting Yemen's rebels since 2015 acknowledged responsibility for the strike, but claimed the bus was carrying "Houthi combatants". It said the coalition had carried out a "legitimate military action", targeting a bus in response to a deadly missile attack on Saudi Arabia on Wednesday by Houthi rebels. Thursday's heavy toll sparked calls from both United Nations chief and the US State Department for the strike to be investigated. "We need blood," said Jameel al-Fareh, an emergency room doctor at Saada's Al-Jumhuri hospital, calling on local people to donate blood to treat the wounded. Ahmed al-Mansouri, the hospital's director, condemned what he called the "massacre of children". Coalition spokesman Turki al-Maliki told AFP that claims by aid organisations that children were inside the bus were "misleading", and that "the elements inside the bus were Houthi combatants". Earlier, Maliki accused the Houthis of "recruiting child soldiers, throwing them in battlefields and using them as tools".